Errol loves gardening, but he doesn’t have a proper garden. Although his home is full of beautiful plants, he longs for an outdoor space where he can grow things. A chance discovery leads to a solution, but Errol can’t do everything on his own. Luckily, help is near at hand. 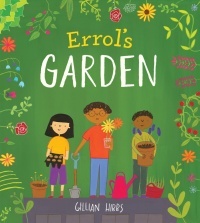 A heart-warming and inclusive tale about how one small boy’s dream of a garden unites a diverse community in a positive and enriching experience for everyone.